Description: ULX110 engine oils are a new concept in petroleum base oils. Advancement in the last few years of specialty additives such as detergents, EP, viscosity stabilizers, and improvers and friction modifiers are needed to meet the needs of today’s transportation vehicles. ULX110 through advanced research and development by today’s lubrication specialists and many top professional race engine builders have formulated an oil that out performs all commercial mineral motor oils. Our emerald green coloured oil far exceeds the requirements of all engine manufacturers to provide maximum protection and performance. Through advanced research and product development, this oil is formulated to provide maximum protection and performance that far exceed the service requirements of most oils and adds years of trouble free performance to your engines, whether Petrol, E85 or L.P.G. Our claims are backed up with a guarantee. Composition: Our premium high viscosity index base oils are blended with top of the line in each category of additives from three different lubricant additive specialists. The additive package adds to the excellence of this product by containing: oxidation inhibitors, detergent additives, rust inhibitors, zinc dithiophosphate, stabilizing agents, dispersant additives, corrosion inhibitors, pour point depressants, anti-wear additives, oiliness additives, anti-scuff additives, foam inhibitors, and organic molybdenum. Performance Advantages: Our multi-grade oils for petrol and special fuels such as nitro methane and alcohol have been designed with the help of some of the top engine builders in the United States. Demulsifiers and anti-scuff agents have been added for extended protection. Dyno tests have consistently shown an increase in horsepower consistent with mineral oils but with none of the bad side effects such as scuffed cylinders and piston skirts, detonation, and weak spark due to wet plugs. Better oil pressure during severe and continuous service applications along with a reduction in oil temperature of 20F or more is also a plus. Our two friction modifiers work together to coat internal engine parts which results in protection at start up, and reduction of internal friction by 38%. This results in reduced fuel consumption of 6.9% or more in most vehicles. 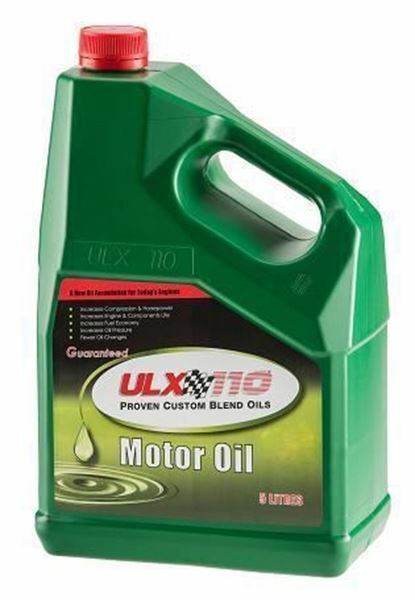 Uses: ULX110 is recommended for use in all internal combustion engines including gasoline, L.P.G. and natural gas engines, supercharged, turbocharged or naturally aspirated engines.